The Visionarry Sport Blind Date specifications are correct, though difficult to believe. The materials list for a boat to sailing stage (not including freight, wastage, taxes, motors, electronics, etc) is approximately $Aus50,000. *Note: additional payload (water/fuel tanks, small generator, batteries, stowage, personal gear, etc) can be added to the lee hull at the expense of speed. The Visionarry Sport Blind Date specifications are correct, though difficult to believe. The materials list for a boat to sailing stage (not including freight, wastage, taxes, motors, electronics, etc) is approximately $Aus50,000. Complete materials lists on new boats are notoriously difficult to calculate as each owner will have their own final specifications. Please check with Rob for the most current price. Blind Date, the first Visionarry Sport is the result of a very specific set of requirements. 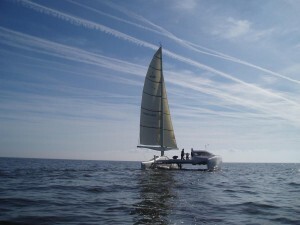 Jan Schippers, the boats owner, took blind people sailing in his Iroquois cat as well as using it extensively to take family and friends cruising along the Dutch coast. The Iroquois is a great boat (Rob Denney owned and cruised one for 5 years) but Jan needed something bigger, easier to handle and roomier. It also had to be fast. Blind people don’t like sailing slowly any more than sighted people. The full list of specs and how they were met follows. Many of these are normal for harryproas, but some of the requirements and their solutions for unsighted crew required a fair bit of lateral thinking for which much of the credit goes to Jan.
Fast: Speed in light air is primarily about the ratio between wetted surface and sail area, in heavy air the important ratios are the Bruce number (power to weight ratio) and the sail carrying power (ratio of sail area*righting moment divided by the vertical distance between centre of effort and centre of lateral resistance). 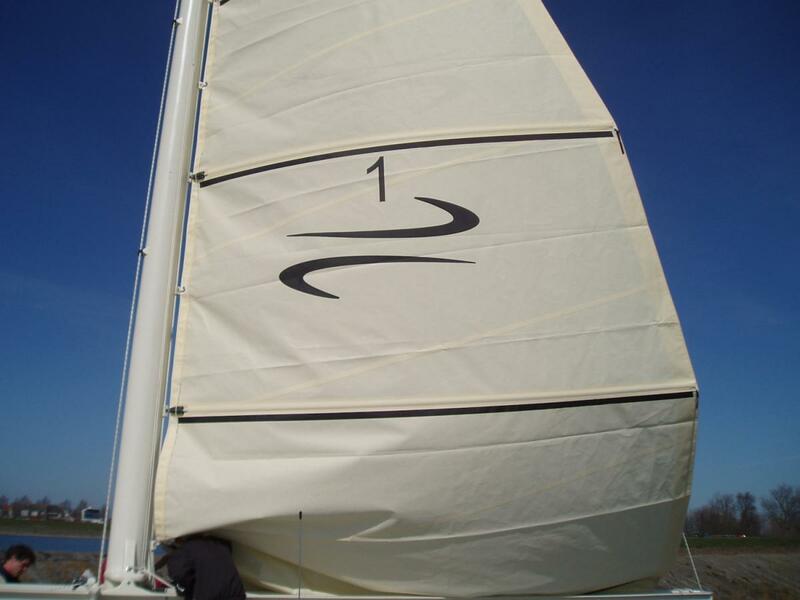 Blind Date has a fully loaded wetted surface to sail area ratio of 4.2, which makes it very fast in light airs. 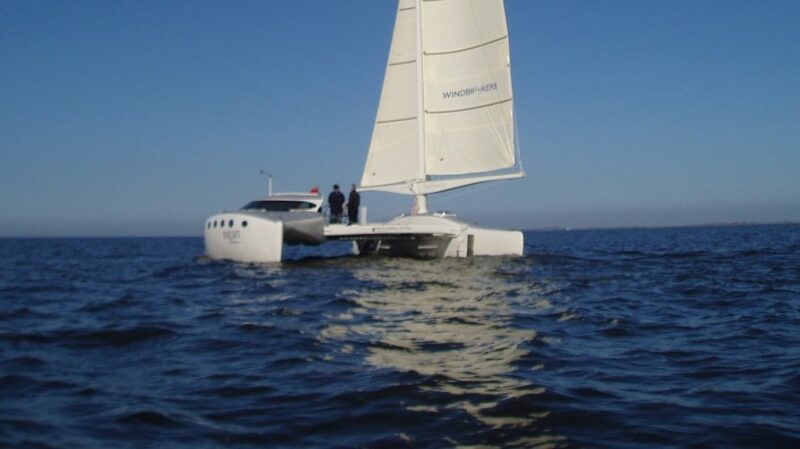 A Bruce number empty of 2 (higher than an empty Formula 40 cat) and fully loaded with 8 people on board of 1.7 It has a sail carrying ratio of 53%, a very high ratio, making it more stable than a clunky cruising boat, yet with the performance of an out and out racer. Easily handled: The Easy Rig and a central steering station mean that Jan is able to sail the boat single handed. There are 2 winches mounted close to the wheel to assist with sheet loads when the jib is not used. These can also double as anchor and halyard winches if required. Because Blind Date is so light, it is tremendously responsive. Blind and sighted sailors are be able to notice immediately the effect of sail trim or course alterations. If it had a conventional stayed rig, Blind Date would lift a hull when the breeze hits 25 knots. 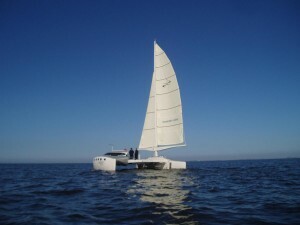 Sensible cruising sailors would reef at 20 knots or less. However, because the rig is unstayed it bends considerably and at 25 knots the ww hull will still be firmly in the water. This element of safety makes an enormous difference in gusty conditions. Spacious. The cockpit seats 8 people and has a cover over it to keep them dry. With a zip on plastic door to seal it completely and a removable table, the cockpit effectively becomes part of the accommodation. 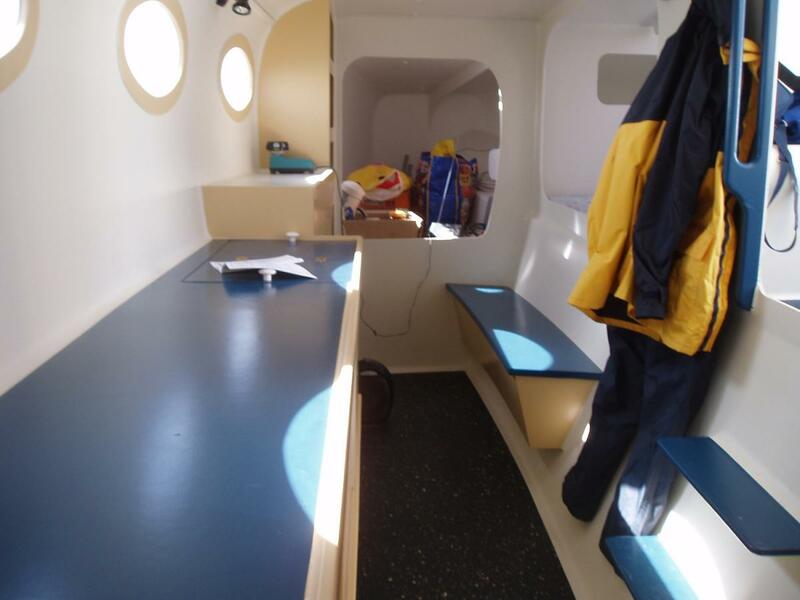 There is a huge shelf area behind the seats and around the hatch for mounting instruments and storing items necessary for sailing which must not get wet (charts, binoculars, radios, sandwiches, cups of tea etc). Inside is typical harryproa, with 2 big double bunks, a toilet and shower at one end and a single bunk at the other. Two shelves run the length of the hull on the windward side with storage between them. The galley is opposite the hatch so the cook stays in touch with the crew, and is in a well ventilated, minimal motion area. There are hatches over the bunks and toilet, and windows along the ww and lw sides of the hull. Structure. Jan employed Rudolf van de Brug to build Blind Date. The boat had to be as light as possible, strong enough to withstand North Sea gales and easily built. Where the structure has to take significant fore and aft loads (the lee hull) it is cedar strip. Where there are large unsupported areas with little curvature (ww hull decks, bridge deck and sides) panels are built from foam and glass. These were made off the boat, using foam cut exactly to shape to minimise the large losses associated with buying ready made panels. Jan and Rudolph also built the rudders, mast, boom and beams, using carbon where applicable. 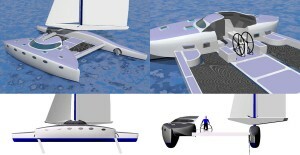 They built all the fittings, mast, beams and boom using the low cost and easy techniques harryproa have developed, following the very easy to follow plans drawn by MarineCad Services. 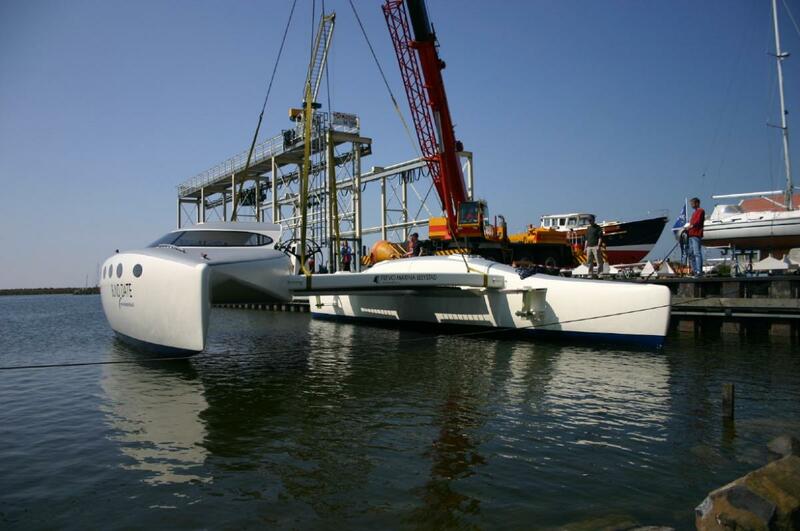 Blind Date took approximately 3,500 hours from start to bareboat launch. Shallow draft. A lot of sailing in Dutch waters is done in very shallow water. It was essential that not only did Blind Date draw as little as possible (400mm/16″) but it had to be steerable at the same time, and the rudders had to kick up without damage in the event of running aground. Jan and Rudolph did not want a rudder protruding through the bottom of the boat. Hitting something at speed should not mean tearing the bottom out of the hull! The design meets all these specs and is cheap and easy to build. Steering. The actual steering is done from inside or outside the cockpit depending on conditions, using one of two wood/glass wheels mounted either side of a pedestal. The wheels are lighter and cheaper than stainless ones. The steering lines are spectra and run outside the boat from rudders to wheels, to make maintenance easier. Many Dutch harbours are very small and very crowded. It was important that BD be able to maneuver in and out of very small spaces. For this reason, the two rudders can be used together if required at low speeds, giving the ability to crab the boat almost sideways. Usability: This was an unusual requirement, but absolutely necessary for a crew of blind people. As well as all the normal Harryproa attributes, we added things like a walkway between cockpit and lee hull, and extended it along the lee hull between the beams; a rail down the middle of this walkway; a cut out in the cockpit cover providing full standing headroom in the cockpit, yet still keeping the wind and rain out; huge flat decks on the ww hull to make it easier to hang out fenders and raft up; flat topped beams for sitting on to fully enjoy the speed and spray; on deck stowage of anchors, lines and ropes and a totally uncluttered interior. The motion is predictable and minimal. By keeping the crew near the fore and aft centre of the boat, the affects of pitching are minimalised. This is aided by the very high (0.76, compared with most cats in the 0.6-65 range) prismatic coefficient, which not only makes for higher speeds, it also minimises pitching. Demountability: The cost and inconvenience of hard standing is well known. Far better to be able to take your boat apart, load the bits on a truck and take it home, or to a shed for the winter, or to work on it. Blind Date has tapered beams, pinned in place. 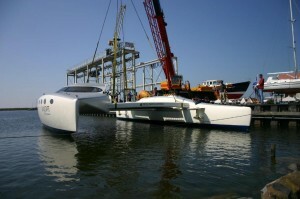 To disassemble the boat the trampolines and walkway are removed, and the two hulls slid apart. 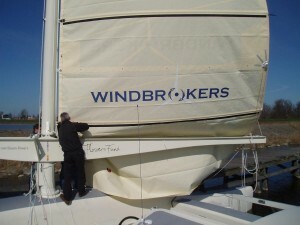 This is a relatively simple operation on a boat that always has the weight to windward and is available on all harryproas.